He may have just turned 76, but Paul McCartney is clearly not ready to retire.. Beatles Radio: The Beatles, Solos, Covers, Birthdays, News The Fab 4 and More! He may have just turned 76, but Paul McCartney is clearly not ready to retire. The Beatle has just released two new singles and announced a forthcoming album. That's right, Macca is back. "I Don't Know" and "Come On To Me" dropped Wednesday. 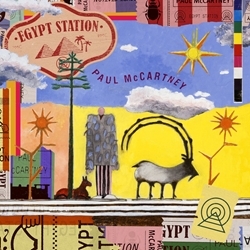 His album, "Egypt Station," will be out September 7. It's his first in five years and McCartney recently spoke to BBC 6 Music about continuing to make music. He said that unlike some people his age, he doesn't disparage today's music. "I listen to people, and I think there's a lot of good stuff going on, myself," he said. "But no, a lot of people my generation will say, 'Oh, music's not as good as it used to be.' But I always say, 'No, that's what our parents said.'" He said he enjoyed working with Kanye West on the single "Four Five Seconds," which also featured Rihanna. McCartney will be keeping busy performing for the next few months, including at Austin City Limits in Austin, Texas, in October, he said. But he did talk to 85-year-old music legend Willie Nelson about retiring. "And he says, 'Retire from what?,'" McCartney said. " And I think that just says it. Retire from what?"